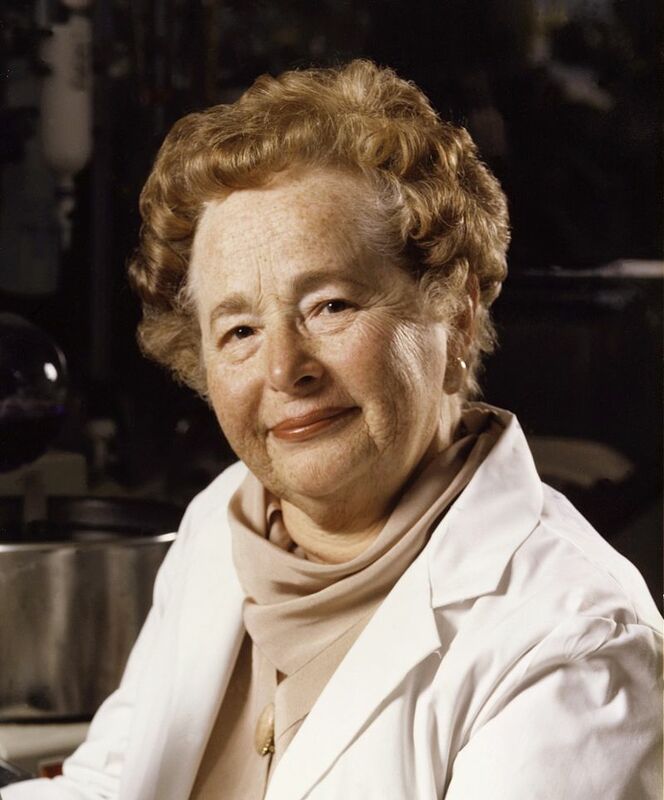 It's Gertrude Elion's birthday today. 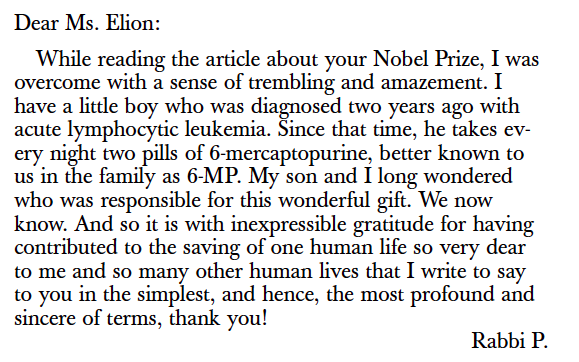 Below is one of hundreds of typical letters of gratitude that she received when she was awarded the Nobel Prize for Physiology or Medicine in 1988. The prize - one of a select few recognizing drug discovery - was awarded to her, George Hitchings and James Black for the discovery of life-saving medicines for cancer, organ transplantation, viral diseases and stomach ulcers. She was only the fifth women to get it. 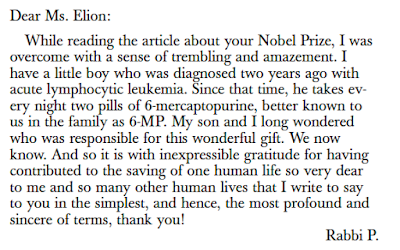 Elion repeatedly used to say that such letters and the saved lives of their recipients had long since made up for any formal honors or degrees that she might have lacked. One such degree was the PhD. When Elion applied to PhD programs after graduating with high honors from Hunter College in New York City in 1938, in the middle of the Great Depression, fifteen colleges refused her scholarships or fellowships because she was a woman. Until then Elion, who had been raised in a strongly egalitarian household by a generous-minded father, never thought that her being a woman would make a difference. But in 1938 in did, and Elion persisted and succeeded against such odds. If some men held her back, others like her father, her fiancé and George Hitchings pushed her ahead. Her fiancé was a young man with a promising career in statistics whom she fell in love with as a student at Hunter College. His death due to a bacterial infection that could be completely cured just a few years later by penicillin cemented two desires in Elion: to stay married to her work and to devote her life to curing human disease and misery. Throughout her life, when she was approached by men either with proposals of marriage or bewilderment that she was a female scientist, she cheerfully dismissed such overtures and simply moved on without holding grudges; her work would speak for itself. Elion found a job at the company Burroughs Welcome (which later became Glaxo Smithkline) by sheer chance, when her father who had seen an ad in the paper asked her to reach out to them. She asked if she could interview there on a Saturday since she was attending classes for graduate school on weekdays. Fortunately the company said yes, and fortunately George Hitchings was also working there on a Saturday. Hitchings was interested in the application of chemistry to medicine. At that point in history, all medicines had been discovered by trial and error, with the latest example being sulfa drugs. Scientists typically sifted through thousands of molecules like dyes and petrochemicals with the hope that one of them would show interesting activity against diseased cells. Antibiotics hadn't been invented yet. Hitchings wanted to make drug discovery more rational, and his hypothesis was that one should do this by looking at the difference between normal cells and abnormal cells such as cancer cells. He had worked on nucleic acids before and he knew that cancer cells used much more nucleic acid for growth and metabolism. Why not try to look at the structures of nucleotides and modify their chemical structures in order to "trick" cancer cells into using the wrong material? Hitchings's idea gripped Elion and she spent the rest of her life exploring its manifestations in a spectacular manner. Hitchings never held her back from going out on her own and made sure she was always listed as an author on all the important papers. There was another woman in the lab named Elvira Falcon; she was both Elion's scientific partner and opera partner, and the two enjoyed regularly watching leading operas at the Met. For some time Elion kept on working part time on her PhD, but she finally decided to forgo an official degree because the dean would no longer let her work part time; he dismissed her by saying that surely she must not be serious about becoming a scientist if she was interested in only working on her degree part time. Elion's lack of a PhD shows both the burdens of the PhD system as well as the prejudice against scientists without PhDs. Among half a dozen others, Elion discovered at least three breakthrough drugs which were the first of their kind and which are still used in diverse areas of medicine. She was a pioneer in both chemotherapy and antiviral therapy. In 1950 she made 6-mercaptopurine which cut the rate of death from acute childhood leukemia in half. Although it brought temporary remission, it could be combined with other drugs to increase lifespan. Elion was only thirty two when she discovered 6-mercaptopurine. Much more important than the specific drug was the new paradigm she unveiled; cancer could now be attacked by looking at chemical differences between molecules used by normal and cancerous cells. It's an approach that is at the heart of cancer drug discovery even today. Another compound made by Elion was azathioprine. Azathioprine dramatically reduced the immune response and became the first immunosuppressant. Until then organ transplantation had been a nightmare, with violent rejection of kidneys, livers and other organs dooming patients to early deaths. Azathioprine made organ transplantation possible. Doctors who used it were heralded as miracle workers and received Nobel Prizes. The icing on the cake for Elion and Hitchings was being able to see and talk to patients whose lives they had played a direct role in saving, a rewarding experience that organizations really should confer on their scientists. The third important drug which Elion discovered was acyclovir, used against the herpes virus. This drug was discovered on the same basis as the anticancer drugs, by assuming that a compound similar to that used by the virus in its own metabolism would thwart its growth. Acyclovir is still used at the frontline when it comes to fighting viral diseases, not just for herpes but also against chickenpox, shingles and other infections. I quickly benefited from it myself when I came down with chickenpox. Elion kept on working until the end of her life and died in 1999. It is difficult to overestimate how many lives she saved with her discoveries, and the steady stream of letters of gratitude she received were the best testaments to her work. She was working in a golden age of drug discovery where relatively cheap research would yield important medicines, FDA regulations were slim and drugs could be easily tested on patients. But the powerful paradigm she unearthed will always be a model for drug discovery. Today the pharmaceutical industry has largely supplanted the logic used by Elion with random screening of synthetic and natural molecules. Perhaps it's time to again refocus on Elion's paradigm and look for molecules that are similar to those used by diseased cells and tissues. Fortunately the field of cancer metabolism and cancer immunology are partly based on such thinking. The flame that Elion and Hitchings lit is still alive and seems to be aglow with new hopes and promises.